on Saturday 3rd of November we have celebrated 1 month of server life. During this first month we have endured much. Countless DDoS attacks, which were defended, epic PvPs for World bosses, which take place every day. All World bosses are beaten, Aden castle was also conquered. Will anyone try to take it from the current owners on next sieges? We still have a lot ahead of us. We would like to thank all players for their support and loyalty to the server which was shown mainly during uneasy server start. We are looking forward to future experience together with you. 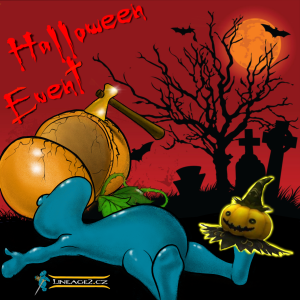 Start of Halloween event will be after regular server restart on Monday 5th of November 2018 at 7:00 GMT+1. Event will end on 11th of November after regular server restart. Event NPCs will be present until regular server restart on 19th of November 2018. Almost every monster in the game world will have a chance to drop Pollen, which you can exchange with the Event Manager for sqash seeds and special weapons. Event Manager will be placed in every town. Clicking the seed will plant it in the ground. You need to pour the squash seed 5 times with a Pollen. (target the seed and use Pollen on it 5 times). The seed will then turn into a squash of various grades. In this moment is possible to harvest by equiping the special weapon you purchased and hitting the squash. Attacking with a different weapon or using skills on the squash will reduce the chance to drop anything. We suggest you harvest the squash in a group of 4-5 people so that the squash doesn't dissappear before you manage to harvest it.